Wherever possible, the best protection for a cartridge is to put it back in the original box that it was supplied in. 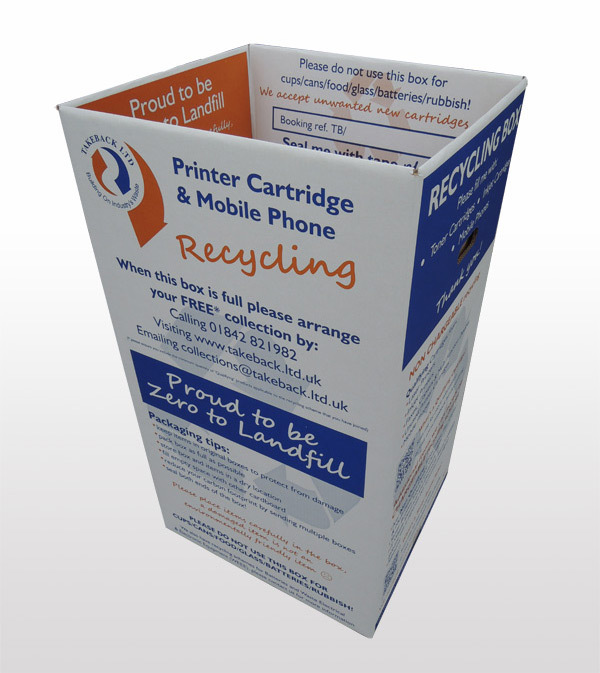 Please remember, a damaged cartridge has no value, as its primal worth is in reuse, not recycling, so for us to receive them undamaged is paramount. If your cartridges are being collected by one of our couriers, please tape closed the individual cartridge boxes and then tape these boxes into bundles of approximately ten cartridges. If it is one of our own drivers that collects from you, there is no need to tape the boxes into bundles, they will be happy to take them loose. 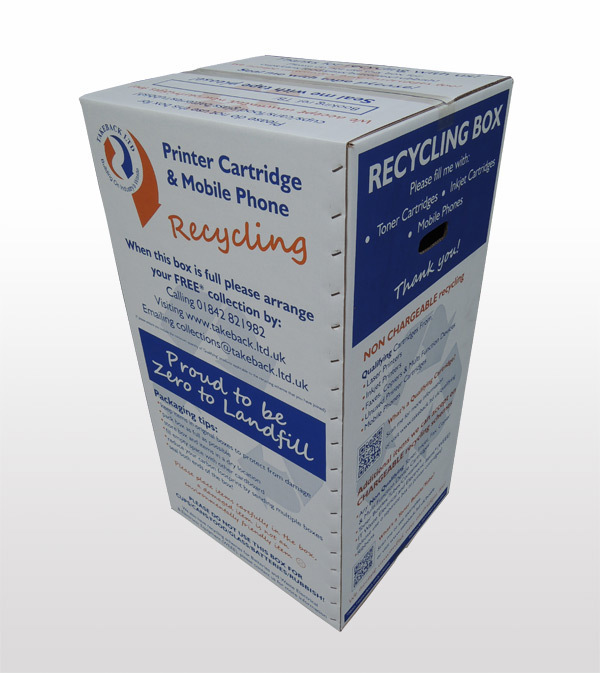 We can supply large collection sacks or boxes to put your cartridges in if required, although it is more environmentally friendly to use the original packaging and therefore reuse and recycle as much as possible. 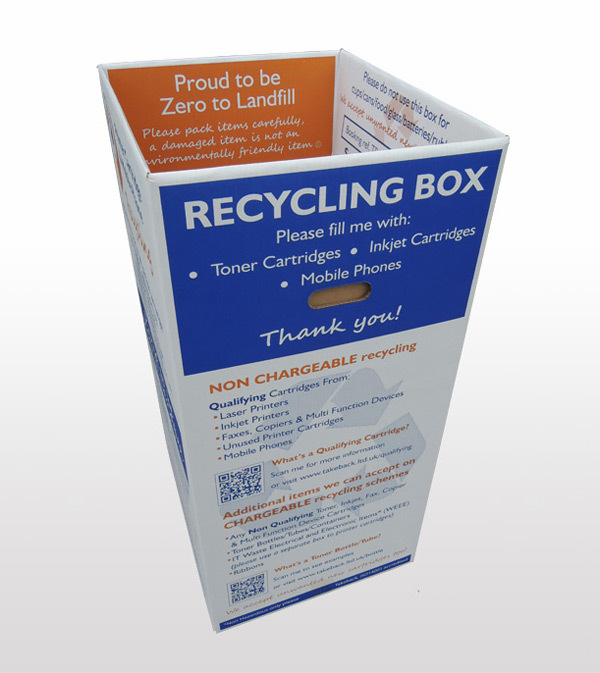 Our boxes are roughly 45cm * 50cm * 85cm high, nicely printed and so suitable to be sited within your actual office environment to encourage recycling. Please click here for some box images. If you only have a small quantity of inkjet cartridges or mobile phones, we will be happy to send you freepost bags to return these to us in. If you have a large quantity of cartridges to be collected and you are not on one of our own vehicles routes, we will probably arrange a haulier to collect the cartridges on pallets. Please stack the pallets to about 1.9m high and make sure they are tightly shrink-wrapped to stop any cartridges from falling off on route. We do appreciate that packing these cartridges does take extra time but the less damaged cartridges we receive the better it is for you, our supported charities and the environment.